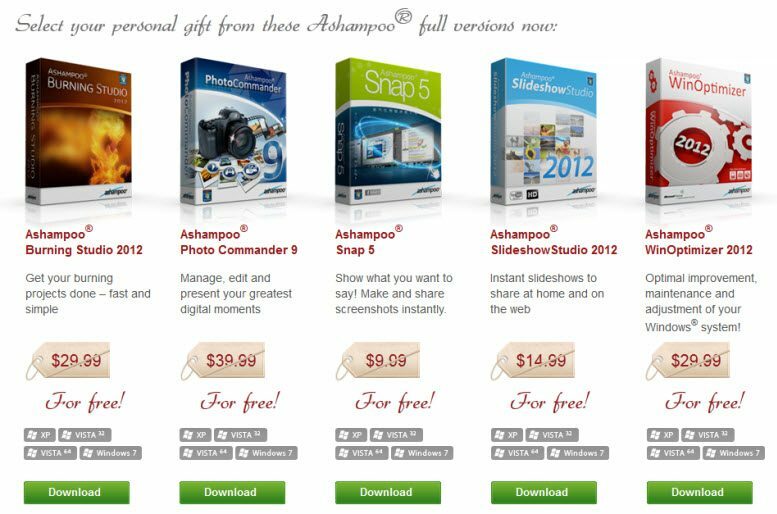 Ashampoo is once again offering 5 top products, all for free. You can download as many as you want… expiry date unknown. Ashampoo Burning Studio 2012 – Full featured burning suite. Ashampoo Photo Commander 9 – Easily manage, edit, and share your photos. Ashampoo Snap 5 – Full featured screenshot capture software. Ashampoo Slideshow Studio 2012 – Create great slideshows for sharing at home or on the web. Ashampoo WinOptimizer 2012 – Full featured optimization/maintenance suite. **NOTE: These are all previous versions but they are also all very good and without any limitations. A new display will open including download links for all five products, simply click on the green “Download” button under your selection(s). Next:What About Cell Phone Insurance? Doesn’t work. It says there are 10 days left, then I have to pay for it. Hi Faye – What says there are 10 days left? Which title(s) did you download? You should have received an email with the licence keys. Did you advise Ashampoo of your email address? I also got a “10 days left” message after installing WinOptimizer but entered their promo code xmas2012 and it seemed to take it (didn’t get an err msg) – guess I’ll find out in 10 days?! Hmmm, just realized the promo code was xmas12 (not xmas2012) so it’s anybody’s guess?! ?